Rent to own homes (also called lease choice or lease purchase with option) has ended up being a popular way of getting into a house when your monetary situation has thrown your house hunt for a curve. But, you may have become aware of a few of the scams out there that have left lots of sincere people out countless dollars instead of finding the house of their dreams. One of the prevalent scams is people posing as if they own or control the home but really once you give them a deposit they take your money and disappear. Some of these unfortunate incidents have made the news here is one example. The way we protect out tenant-buyers is that all our financial transactions are done through a licensed Attorney who has practiced for many years or in some cases we use the services of a Title company. How does that work? When you find the home of your dreams through us you will sign all the paperwork involved at the office or the Title company; the check is made out to those licensed establishments at that time, so you know they are legitimate. The of scammers that are out to take advantage of good people both prospective renters or house owners is increasing. Numerous forms of scams exist that have come out recently. There are those terrible scammers who shamelessly take advantage of popular property purchasing methods and offering websites to scam prospective renters, specifically immigrants. Disgusting! They develop counterfeit sites of the popular websites and set up luring advertisements. As soon as a person falls for them, a series of email communication streams and the renter makes a deposit, and that is it – once that deposit is sent out to the scammer … it’s almost painful to find who did it or how to get the cash back. The most significant scam that is out there for possible tenants or rent to own buyers is described listed below. Some scammers are getting clever about how they mean to part you from your hard-earned money. The listing looks genuine … so you go and take a look at it … maybe even meet the fraudster face to face … they tell you other people are planning to lease the house too, so you better put a deposit on it today … so you do. Exactly what you do not know is that fraudster had a whole slew of other possible occupants go to the very same home that day and put a deposit on the home as well. The scammer then takes the deposits … cashes the checks … and disappears. A version of this scam likewise can happen where you don’t even see the home, and the scammer uses high-pressure scarcity tactics to scare you into sending them the money to hold the property for you less you lose it to another buyer. So, you do, even before you see the property face to face, and now your money is gone forever. Now … how do you prevent being a victim of a scam and how do you safeguard yourself during the process? Tip # 1: Confirm the identity and contact details of the individual or business marketing the residential or commercial property so you know they’re sincere and legitimate. Idea # 2: Never offer a money deposit … and never hand a deposit check out without a contract in hand to an individual you have verified is legitimate. Pointer # 3: Do not ever feel pressured to put a deposit down “today!” if you feel unpleasant doing so. Trust your gut. Suggestion # 4: Search the address of the property online and see if you can discover the correct current owner of the property. If the name of the person who you are talking to and of the property owner is not a match, ask that individual to prove their identity and show you where they get the authority to lease the home to you. Tip # 5: A last resort, if you ever do not feel ideal about it … simply leave. There will constantly be more houses that will happen. When checking out the residential or commercial property, ask the Identity of the representative. Avoid buying representatives that are not yet established. Go for established ones. Perform due diligence on property managers websites to be sure the sites and the property managers are authentic. Avoid making in advance payments until you are specific the representatives or property managers are real. Treat prospective sellers whose e-mails are written in broken English with suspicion. You may browse them in google to learn whether they have been listed as scammers or not. Look for the guidance of experts or the experienced in the local real estate market. When making payments or deposits, ensure you have your lawyer included. In conclusion, it is up to you to be diligent to avoid being taken advantage of. They state when the offer is too sweet, hesitate. Don’t rush into sealing deals before they can prove they own the property or are authorized to rent the property. Ideally, these suggestions will help you avoid rent to own house scams in Jupiter Fl, and now you are armed with some tips that will give you a new sense of confidence as you look for you Rent-To-Own a home! Looking For A Credible Rent To Own House In Jupiter Fl See Our Readily Available Properties Below! 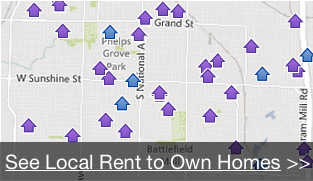 We at palmbeachrenttoownhomes.com are among the Jupiter Florida area’s leading rent to own home specialists. We welcome all your questions about the rent to own process, or all things rent to own. You can contact us by going to the contact us page HERE of our website or give us a call at 561-771-4347.